KUWAIT: Ooredoo Kuwait concluded the fourth edition of its annual football tournament “The Ooredoo Cup”, which was held at Hasan Abul Youth Center in Dasma. This is the fourth year in a row where Ooreodo holds this event which aims to further engage with employees from different departments and divisions. The event aims to gather employees in a casual friendly atmosphere, outside of the office premises and working hours. The final game day saw a friendly match between a team that comprised of Ooredoo Kuwait senior management, who played against Samsung Kuwait. The game was attended by Mohammad Al-Babtain, CEO of Samsung’s official distributor in Kuwait, who sponsored the tournament with devices for the winners. 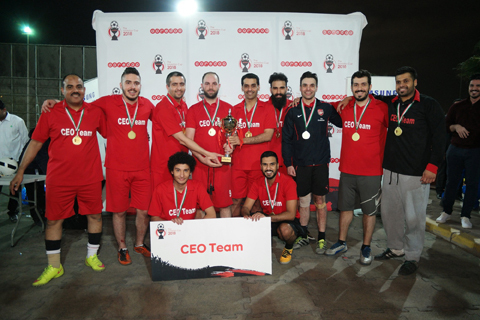 The winner of the trophy this year was Ooredoo’s CEO Team, which scored a single goal and defended all attacks against their goal by the opposing Sales Team, ending a high-octane final game with a single-goal victory. The final ceremony including special awards for specific categories. Mohammad Al-Dousari from the Sales Team won Best Player, Hussein Al-Shemmari from the Sales Team won Best goalkeeper, the B2B Team won the Fair Play trophy, FawazZakaria from FASTtelco won Best Player (as voted by the audience) and the Top Scorer award went to Hesham Hussein, from FASTtelco.